Getting back into a normal routine after a long break can sometimes be a little tricky owing to (please pardon the pun) a little sluggish inertia, particularly after the extended period of festive overindulgence. At the beginning of last July I wrote a brief piece on Britain’s perennial favourite topic – the weather – and in it opined that whereas I thought that September was likely to offer us the best prospect of a dry warm spell it could well turn out that the resident Chinese population might “change the designation of 2012 from ‘Year of the Dragon’ to ‘Year of the Slug’.” Unfortunately, my facetious weather ‘forecast’ for the remainder of 2012, with the exception of October, turned out to be reasonably accurate, discerning as it did much more wet weather to come. Indeed, by the end of December The Daily Mail used my very own designation for the year in its headline ‘Year of the slug: 2012 was a washout for gardeners but perfect for pests’. The past year was, in domestic meteorological terms, the most miserable that I can recall, and few can be hoping for a repeat of the seemingly interminable deluges that have of late bedevilled us. Farmland, homes and businesses were flooded, holidays were ruined and little prospered other than the seemingly ubiquitous and quietly triumphant hordes of slugs, accompanied on occasion by squadrons of malicious mosquitoes. This week we learn that the poor weather has had a negative impact upon the nutritional content not only of our food crops, but also of the grass upon which our livestock have fed when our pastures have not lain inaccessible beneath water. 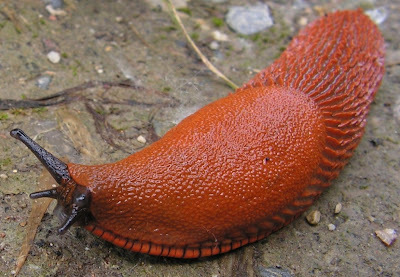 As if this situation in itself was not bad enough, a story in today’s Daily Telegraph draws our attention to an unwelcome new resident that is finding our green and sodden land a highly appealing home: a five-inch long monster slug from Spain revelling in the Latin name of Arion vulgaris. This nasty pest apparently possesses a hefty appetite for carrion, and in Scandinavia, where it has also managed to establish itself of late, it is reported as having become a hazard to motorists owing to the prodigious quantities of slime that the slugs leave on the road when feasting upon roadkill. Arion vulgaris thus joins the harlequin ladybird, the New Zealand flatworm and of course the grey squirrel as but the latest in a line of invasive species that have been displacing and replacing the native fauna (although admittedly few would own to feeling any particular affection for our domestic slugs). What with sudden oak death and ash dieback, the contemporary analogues of the Dutch elm disease of the 1970s, our natural environment, rather like our social one, is suffering from the ill consequences wrought by the mighty forces of globalisation, with genuine diversity being replaced by transnational homogenisation. Will 2013 become a second ‘year of the slug’, or will we finally enjoy a respite from the rain? Given the saturated state of the country, it may perhaps become the year of the mosquito. Whatever the case, thus far we seem to have been experiencing a stereotypical British winter: miserably grey, damp and mild. A taste of chilly winter weather lies in the offing later this week, and possibly lasting for much of January, but will it really deliver upon its promise? The Met Office, as is oft its wont, is being equivocal, and Piers Corbyn won’t tell us that his predictions about the winter were ‘right’ until some time after the event when he can find some weather that tallies with a forecast that he had sold to his exclusive set of subscribers. Surely, 2013 must be better than 2012 meteorologically? We have not had a decent summer in over half a decade, so would it be too much to expect some fine weather for the summer of 2013? It's the same weather pattern responsible for the bitter 2009-2010 winter, the coldest for 31 years when transport networks were crippled and planes grounded. Icy easterly winds will sweep across Britain with everywhere at risk of wintry showers from the weekend and "significant snowfall" over high ground in Wales and the North. The statement above is simply incorrect. Glaringly so. One of the notable features of the exceptionally low temperatures in the first month of the remarkable winter of 2009-2010 was the fact that the month of extreme chill with which it began was ushered in by a front issuing from the Arctic North, not from the East. It was bitter northerlies which prevailed during the coldest first four to five weeks of that winter that began with a surge of Arctic air during the last week of November. This is why the eastern counties of Britain and areas such as the North York Moors were particularly badly hit by snow. Facts? Now, why would journalists wish to bother with such irksome details as facts? I await the Express's first heatwave headlines with bated breath (sometime in March or early April perhaps? ).